Portrait of a poisonous mushroom: the destroying angel. Notice the skirt-like ring hanging on the stem and, especially, the “cup” around the base. Fall is mushroom season, coinciding with the coming of Halloween, and among the spooky seasonal sights you might glimpse is the most poisonous mushroom in Westborough’s woods – the all-white destroying angel. If you happen to spot a destroying angel, or even a mushroom that you think might be one, it’s fine to admire it, but not to eat or even taste it. This mushroom and its close relatives – other Amanitas, sometimes called death caps – cause 90 percent of the deaths from mushroom poisoning. It doesn’t have to be the Halloween season for destroying angels (Amanita bisporigera, Amanita virosa) to appear. They can spring up from the ground in summer or fall, usually between July and November. Like other mushrooms, this one can appear quickly, seemingly overnight, especially after a rain. 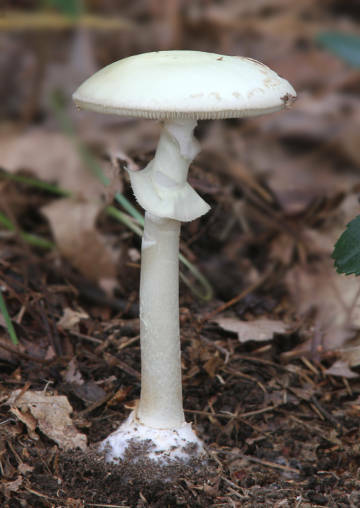 Look for the destroying angel in woods with both hardwoods (such as oaks or aspens) and cone-bearing trees. You might spot a lone ghostly specimen, or several – which might be growing in a circle called, of all things, a fairy ring. As with other mushrooms, the part we see above ground – the mushroom itself – is the part of a fungus that has the job of producing and spreading spores. The mushroom’s gills, under its cap, make and drop the spores. The cap protects the spores from rain and raises them up where a passing breeze may catch them. Both gills and spores are white in the destroying angel. The mushrooms of a fairy ring grow at the outer edges of an underground fungus. The main part of the fungus lives underground as a huge network of threads growing throughout the soil. The job of the threads is to absorb water and nutrients. A destroying angel mushroom often has a skirt-like ring hanging on the upper stem and a cup-like structure or membrane surrounding the base of its club-shaped stalk. Both skirt and cup are leftovers from the membrane-like tissue that protected the mushroom in its young, egg-shaped “button” stage, but they can wear away so you won’t always find them. The cup at the base is also sometimes buried in the dirt, where you won’t see it unless you dig up the mushroom. In other words, you can’t rely on the skirt and the cup in identifying the destroying angel. All parts of the destroying angel are poisonous. Even a small bite can be deadly. Its toxin attacks an enzyme that is key to the ability of our body cells to make the proteins they need on a daily basis. In poisonings from this mushroom, symptoms first appear six-to-eight hours after the mushroom was eaten. (This is later than symptoms of ordinary food poisoning would usually appear.) They may include nausea, vomiting, cramps, diarrhea, and fever. At this stage, the toxin has entered the bloodstream. These symptoms then often seem to pass and the person may feel better. Then, three-to-six days later, the toxin has damaged the liver and kidneys, the very organs that work to remove toxins from the body. These organs and others soon fail, leading to death. A liver transplant can sometimes save a person. Why does the destroying angel produce its toxin? Most likely the toxin is a defense that protects the mushroom from animals – including insects and grazing animals – that might eat or damage it. The deadliness of the destroying angel might lead us to think of it as all bad, but like many other mushrooms, it forms a beneficial underground relationship with tree roots. This relationship is good for both the trees and the fungus. The fungus gets a share of the sugars that the trees manufacture using light, water, and carbon dioxide, and the trees get some of the water and minerals absorbed by the vast underground network of fungus threads. The destroying angel forms this “fungus-root” or mycorrhizal partnership with oaks and other trees in our area, and the trees grow better because of it. Whether you spot a destroying angel or not, you’ll find lots of colorful and interesting mushrooms and other fungi in Westborough’s forests in October, especially in the days after a rain. If you’d like to look for them with an expert and learn more about them, sign up for the Westborough Community Land Trust’s fall mushroom walk with Larry Millman, author of the field guide Fascinating Fungi of New England. He returns to Westborough on Sunday, October 27, 1:30-3:30 pm, to search for mushrooms in Wile Forest, rain or shine. (Meet at end of Carroll Drive, off West Main/Kendall/Frances Dr.) Sign up through the WCLT web site http://www.westboroughlandtrust.org. On the WCLT web site you can find a map of Wile Forest and the adjacent Libbey Conservation Area and also read the October 26, 2012 Nature Notes about the 50 mushroom and fungus species that Larry Millman found on last year’s mushroom walk (behind Mill Pond School at the Headwaters Conservation Area).